Eric Brimmer of Susanville, California, was nice enough to share the pictures and story of the monster California buck he took this past season. 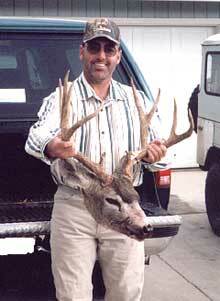 On the opening weekend of the California G-1 hunt, my buddies Dave, Loyal, and I decided to hunt outside of Chico. The first day was a mess  heavy rain and fog to the point that you couldn't see a thing. We ended up going home early in the afternoon, soaked to the bone. Watching the weather channel that night, we prayed for even a small break in the weather! locations to public land near Red Bluff due to the lack of deer that we had seen the previous day. We parked the trucks near the bottom of a canyon, split up and started hunting. I usually hunt with a muzzleloader, so I am used to still-hunting and sneaking around the hills looking for that close shot. I had been busy with work and hadn't had time to sight in my center-fire rifle this year, so had instead taken my wife's Remington Model 7 in 7mm-08 with a 140-grain CTX Nosler Silvertip, which she had just finished using the week before. About 10 minutes out of the truck, Loyal took a nice 18-inch 4x4, and a small 12-inch fork got up about 35 yards from me. I scoped him but passed him up as I didn't want to end the season so soon with that small a buck. The rest of the day was uneventful. Picking up where we had left off the day before, Dave and I got a late start and didn't begin hunting until about 9 a.m. We parked the truck and started up opposite sides of the canyon, still-hunting our way along. About 400 yards from the truck we started to get into deer. We gave each other hand signals and slowly began working our way up the canyon.... when there he was, a huge buck. He was about 180-200 yards away and had his head down. I took another shot and he was gone. We were only about 300 yards from the top of the canyon. He had nowhere to go that we could not see him, yet somehow he got up over the rim. We started to track him up the hill and across the flats. I kept my head down searching for blood and tracks, and Dave watched out in front of us until we caught up with him. After I had a good prone position, I had Dave yell and the buck went down at the shot. I had hit him low in the shoulder and lower leg on the first shot, and he had traveled about 1 1/4 miles in over two hours. I hadn't realized that he was as big as he was until we walked up on him and my buddy said, "That is the biggest California buck I have ever seen!!" The buck was 24 3/4 inches wide and 20 1/2 high, with 2-inch eye guards and good mass all the way up his antlers!! He grossed 153 1/8 B&C, but will not go in the record book because he was on the wrong side of the Sacramento River, according to B&C rules. 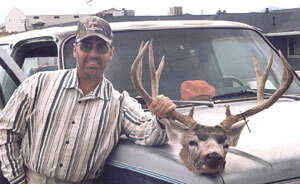 I did talk to a warden, though, and he told me that my buck is just a BIG, OLD blacktail. I did enjoy taking this monster buck!! !